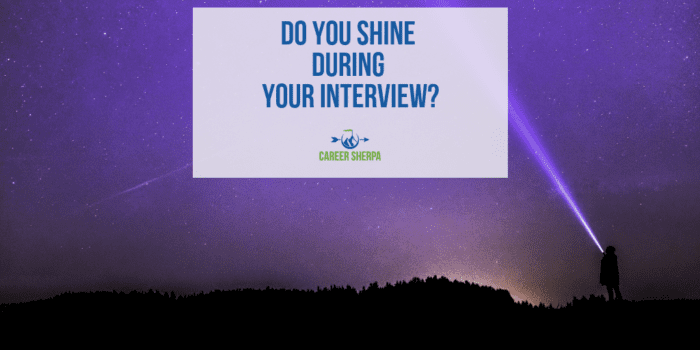 Do You Shine During Your Interview? In order to shine during your interview, you want to feel in control and ready for almost anything the interviewer throws your way! Well, here’s the secret! You can learn a lot from improvisational actors. Did you know they’ve pre-planned their entire act! They know the content they’ll use, no matter the situation. They are masters of “thinking on their feet!” You can do this too! In advance of your interview, review every requirement in the job description. Then, for each requirement listed, think of a time you have done that well (or something similar). 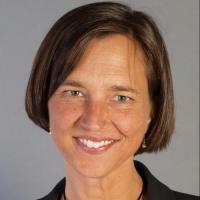 Recall and document the specific example of a time when you did what they are looking for. These are called STAR stories or accomplishment stories. 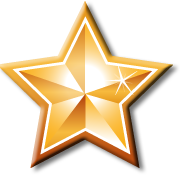 A good STAR story is concise, with just enough detail and has a quantifiable result. The STAR acronym helps you structure your answers. S stands for the situation. This is where you provide a very high-level overview of the scenario. T stands for the task you were assigned or took the initiative to solve. In other words, describe in one sentence what made the situation a challenge. A stands for the actions you took. Use bullet points to state what you did, step by step. And finally, R stands for results. This would be the quantifiable outcomes of the steps you took to resolve the situation and challenge. 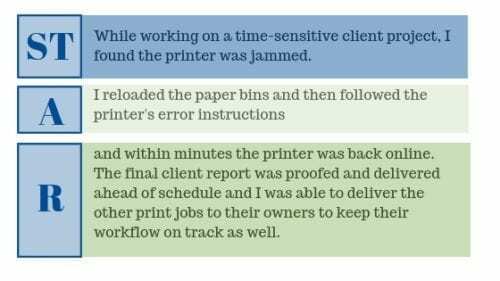 While working on a time-sensitive client project, I found the printer was jammed. I first reloaded the paper bins and followed the printer’s error instructions and within minutes the printer was back online. Not only was my report in the queue but so were several other jobs. The final client report was proofed and delivered ahead of schedule and I was able to deliver the other print jobs to their owners to keep their workflow on track as well. These compact stories pack a memorable punch! The results in your story help the interviewer understand the value you add to an organization. Some job search coaches say your answer should take between 60 seconds to two minutes. And it isn’t enough to write down your stories. Follow the advice of actors and comedians and practice your stories out loud. Running through them in your head just isn’t the same. It is the tone and pace of your delivery that makes a difference. Smile, speak clearly and with conviction! Why wouldn’t you? You are speaking about something you know a lot about…your previous work successes! Whether the question asked by the interviewer is “what is your greatest strength” or “give an example of a time when you took responsibility beyond your scope of work”, the previous sample answer works for both. Your story could potentially answer a myriad of other questions as well. When you have prepared one story for each of the job requirements, you will feel confident that you have an answer for almost every question that will be asked of you. 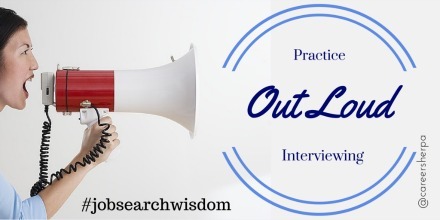 And most importantly, you’ll WOW the interviewer by coming across as prepared, confident and memorable. 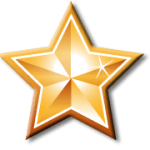 Download a template and worksheet to help document your STAR stories.